The DiaScope Vario 15-56x/20-75x Eyepiece from Zeiss provides variable magnification to enhance the viewing capabilities of the Victory DiaScope spotting scope. With a 65mm DiaScope this ocular offers 15-56x magnification and a 2.9-1.2° FOV. When it's installed upon an 85mm DiaScope, the magnification is 20-75x with a 2.3-0.9° FOV. Optically, the Vario 15-56x/20-75x eyepiece has been engineered to match the performance of the DiaScope T* FL spotters. Achromatic fluoride-glass lenses have been implemented for their exceedingly high level of visual acuity and accurate color rendition. The exterior lens surfaces have been graced with a protective LotuTec coating that sheds water, mist, fog, and oils. By minimizing the presence of these image-dispersing contaminants, the LotuTec coating maximizes the lens' optical qualities. Every air-to-glass surface of each lens has been fully multicoated with Zeiss' proprietary and legendary T* coating to ensure optimum light transmission, contrast, and color fidelity. A simple yet robust bayonet mount ensures a secure fit to the DiaScope's housing - a simple twist-to-attach operation puts the ocular into its working position. Eye/sunglass wearers will greatly appreciate the eyepiece's generous 16mm of eye relief along with the adjustable twist-up rubber eyecup. Eye Relief 16.0 mm / 0.63"
Box Dimensions (LxWxH) 5.8 x 3.9 x 3.4"
DiaScope Vario 15-56x/20-75x Eyepiece is rated 4.5 out of 5 by 2. Rated 5 out of 5 by The Eaglewatcher from A must have eyepiece ! 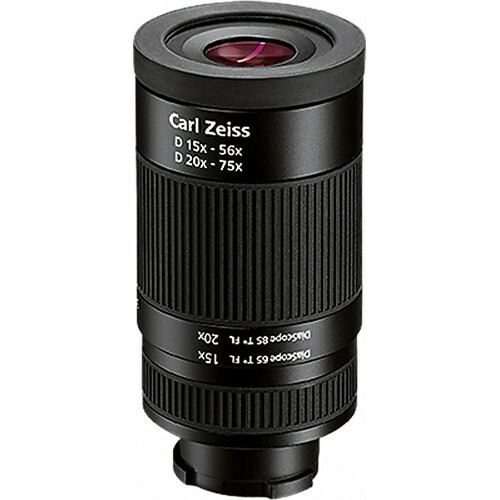 This is a remarkable eyepiece for the Carl Zeiss 85T diascope ! Pictures taken through this eyepiece are wonderful ! Rated 4 out of 5 by mjack13 from Remarkable eyepiece but... I like the brightness and clarity of this eyepiece and the extra reach 75X provides. However, I am disappointed that the bayonet mount does not provide a secure fit with my older scope body. A little electrical tape prevents the eyepiece from loosening and seems to work well. The now discontinued neoprene protective sleeve that came with my scope extends over the tape so I don't mind it so much. How does this eyepiece compare to the older Vario 20-60x eyepiece? Aside from the high end of the zoom, is it worth upgrading for optical quality?